Cook onion, garlic and bacon in 3-quart nonstick saucepan over medium heat about 3 minutes, stirring occasionally, until onion is tender. Stir in remaining ingredients except lemon wedges. Heat to boiling; boil 2 minutes. Reduce heat; cover and simmer about 2 hours or until beans are tender. Place 1 cup of the soup in blender container. Cover and blend on high speed about 30 seconds or until of uniform consistency; stir into remaining soup mixture. Serve with lemon wedges. Don't cheat on the cooking time! 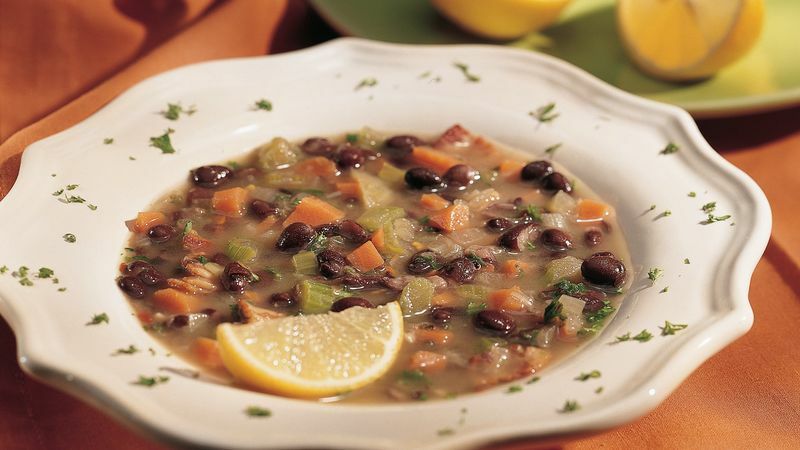 Simmering this soup over low heat for the full cook time will help extract the maximum flavor from the ingredients and ensure the beans are done.